Something else I remember from winters past was grandma's snow fence. Grandma had a fairly long, thin driveway, and without the snow fence, I'm sure it would have been blown shut more often than not. When my brother bought grandma's place, he planted a treeline where the snow-fence had been. This now protects the driveway (even better than the fence). We planted windbreak trees as soon as we moved here, but they'll take a while to grow. Like grandma, we have a long, narrow driveway. Unlike my brother, Rich, we can't plant trees parallel to it along the whole length, because part of the land upwind from it belongs to our neighbor. After spending many days during the winter of 2013-2014 stuck at home because the driveway drifted shut almost as soon as it was plowed (see the driveway in the post, ‘The Long Winter“), we decided to put up a snow fence. In this post I'll discuss why and how snow fence is used, so you can decide if you'd like to use it for your home. Anything that blocks the wind enough to cause the snow to pile away from the road or area you are trying to protect. This could be a slat wood snow fence, green plastic fence like the one in the photos, or a line of bushes or trees. First off, remember that the goal of a snow fence is not to stop snow completely. Instead, it redirects where the snow piles up. 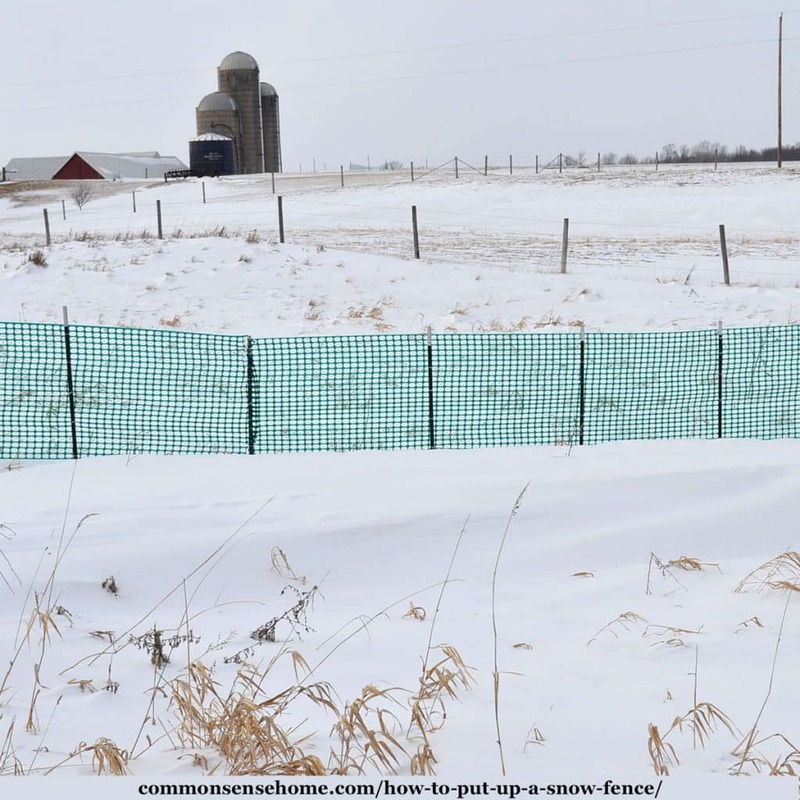 A properly installed snow fence slows down the wind, causing a drift to pile up on the downwind side of the fence – instead of in your driveway or road. A snow fence can significantly reduce the need for plowing, and keep roadways safer by reducing blowing and drifting onto the road. The snow blows with the wind. The fence creates a pressure differential that causes the air to drop the snow in the lower pressure just behind the fence. The exact spot where the snow will pile will vary with the height of the fence, how much air can get through the fence, the wind-speed and other factors. You can see in the top photo of the post how a sizable drift had formed downwind of the fence last winter. The photo was taken in late winter after the snow had started to melt. Other areas had cleared, but the drift was still intact. In some areas, farmers purposely stack the drifts so they melt and flow into a water basin in spring. The open weave of a snow fence slows down the snow and redirects drifting. 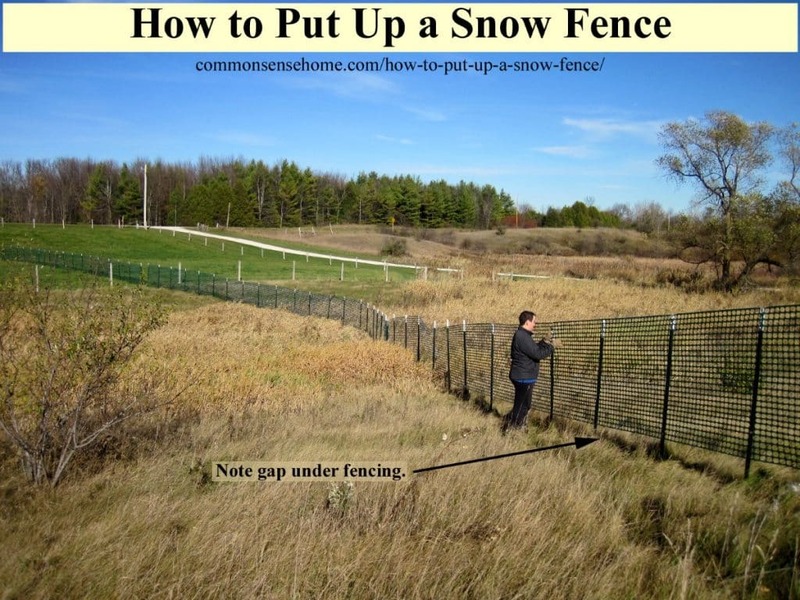 Snow Fence should be installed upwind of the area that you want to keep clear. For instance, our winds come mostly out of the west and north. Our driveway runs mostly north to south, with a bend that angles southwest. We put the snow fence parallel to the driveway to the west and northwest along the path of the driveway. Snow fence placement is critical. Too far and the effect will be lost. Too close and the snow will pile where you don't want it. We found some disagreement as to how far from the road the snow fence should be. The Strategic Highway Research Council, U.S. Fence, Iowa DOT and Ohio State University say the snow fence should be placed 35 times the height of the fence away from the road, which would be 140 feet for a four foot tall fence. The roll of snow fence we bought at the local home improvement store said 60 feet. We went with the online references the first year since we had the room. 2018 Update: This year we're shifting to the 60 foot distance, based on previous year's drifts. We changed the snow fence placement based on results. Putting the fence a little closer may also offer more protection to the driveway to our neighbor's hunting shack, which runs parallel to our driveway, downwind. Ideally, there should be a gap underneath the fence of at least 5 inches. Native grasses, or other ground cover require us to move the wind-line up. The fencing should be 5 inches above the matted grass. The higher the fence is off the ground, the further away the drift will start. If the fence is directly on the ground, it may become buried in the drifts if snow load is heavy. This will reduce its effectiveness. It's hard to see the gap in the top image because the grass is so tall, but you can see it better in the image below. How Do you Install a Snow Fence? Remember, this fence is meant to be load bearing, so use enough posts. Set the posts well in the ground and make sure the fence is well-secured to the posts. place the fencing on the windward side. Our primary wind comes from the west, so the fence is all on the west side of the posts. We use t-posts, not metal u-posts, because they are stronger. For areas with very heavy wind and snow loads, you can secure the ends of the fencing with additional support wires as detailed at the U.S. Fence website. Fencing orange snow fence or the green plastic fencing. 50 ft sections may be more manageable, and 100 ft may be more practical in longer runs. Figure out your placing and dimensions before you buy. We don't suggest barrier fence or safety fence as the function is not the same. Regardless of what you purchase read the instructions because the overall size and gaps in the fencing affect the placement of the fencing. 6 foot t-posts we suggest a quantity of 7 to 11 (depending on spacing) for 50 feet of fencing. Taller is better so 7ft posts are better than 5ft. Place fence posts no more than 8 feet apart, closer for stronger winds. We put posts every 5 feet because of wind load. Drive posts in approximately 1.5 feet deep (to shallow and the will pull free of the ground in heavy winds). Line up fence on posts (on the windward side), leaving a gap below the fence (at least 5 inches). Because we have several hundred feet of snow fence to put up, we skip the slats and use extra cable ties. So far, so good. The fence has survived 3 years of use, and is still in good shape going into the fourth winter. We install our snow fence in late October/early November. Obviously, you need to get the fence in place before the ground freezes and the snow starts stacking up. The fence comes down each spring once the main risk of heavy snow is past. We use a wire clipper to remove the zip ties, and gather them up for disposal. Then we roll the fencing and store it for the summer. We remove the posts and knock the dirt off. We don't leave it up all season because the materials would degrade sooner due to sunlight and general weathering. Part of the fence goes through the neighbor's hay field, so he needs access during the growing season, too. The best snow fences are about half solid and half open. The solid material blocks or at least slows the wind. The pressure changes because of the openings in the fence or treeline drop the snow as the wind blows through the fence. You don't necessarily need to purchase fencing. Pallets will work, slat fencing will also, even planks staggered at roughly 50% air and board will work. You can create a living snow fence with a line of staggered bushes or evergreen trees, is best at a good distance varying by height and density. A second line of staggered plastic or wooden fence or shrubs will reduce wind a second time and drop any remaining snow. Make sure you know your prevailing winds, angles and distances. Use each years experience to improve your fence the following winter. Closed in spaces like a city or subdivision will likely need some creativity. You will need to be creative with the spacing and work with neighbors to ensure the snow drops where you want it. We have seen people extending a wall with fence to create wind barriers and drive the snow through a series of fences between houses depending on the prevailing winds so the snow drops between buildings away from driveways and streets. Yes they work. In our case, I we clearly see the drifting on the downwind side of the fence. We had major drifts in spring of 2018, it definitely works. Since we first did this, I've been seeing more snow fences around. I know at least one neighbor liked the fence, because he stopped in to ask where we bought it. They liked the green snow fence more than the orange fences they'd seen around. Another interesting application for the fencing is to use it in combination with trenching. This catches the melting snow and directs it to specific areas. Since part of our fence goes through the neighbor's field and part is in a marshy area, this isn't a very practical option for us, but I could see where it might be useful. If you are in an arid region, consider this to feed into swales or ponds. Have any questions? Have you used a snow fence? How did it work out for you? (ask question in the comments section below). P.S. – To the various fence company representatives who keep leaving comments with links back to your fence company websites, please see our Media Kit for advertising rates. Inappropriate comments are deleted and/or marked as spam. We live next to a big open park. After a good windy snow my neighbors will have driveway showing. We on the other hand will have feet of snow drifted over ours. Years ago I discovered the benefits of a snow fence. Ours was installed just after Halloween running east-west almost along our lot line. It is approximately 35′ away from the drive and does a fantastic job. Saves me tons of time and a sore back because I do most of the snow removal. Thanks for sharing your experience, Denise. With that narrow of a strip of land, the physics of the snow fence won’t work. Is there any chance the neighbor who owns the field next to the driveway would let you put up a fence for the winter? This is what we do for the section of the driveway that is landlocked by our neighbor’s field. He runs cattle in there, but not once the snow falls. We put the posts up in fall, but with the warm start to winter, the cattle stayed in the pasture until the week before Christmas. We end up putting the fencing on as a storm blew in the Monday after Christmas. Not fun, but we got it up in time. Otherwise, you’re going to need a snow removal option. If you don’t have a vehicle that can have a plow mounted, maybe you can make a deal with a neighbor who does. We hire our neighbor with the pasture to do our driveway when he’s doing his, since we have a van but no truck. I grew up in Utah, similar to your experience, our winters generally lasted for almost six months. I remember having fun as a kid and building snowmen, having snowball fights, all of that stuff. I was surprised when my family moved in my freshman year of college. The new house they moved to got easily twice as much snow as our old house ever got. I think it definitely would have been nice to know how to do this. If we would have been able to control the snow at least a little bit it would have been helpful. I guess I’ll just have to keep it in mind for the future. Thanks for the information! I need a snow fence around my property, but I’ve never installed one myself before. It’s good to know that I should use T-posts instead of U-posts. I usually use U-posts for my fences, but they’re not exactly load bearing fences. It makes a lot of sense to use T-posts for a snow fence to make it more load bearing. Thanks for your article, Laurie. I have a couple of questions. 1. I noticed that you used the plastic netting for snow fencing. Are you able to discuss the difference between the netting and the traditional red stake wooden snow fencing? Would the wooden fencing need to be off the ground? I’ve not seen that fencing installed off the ground before. 2. 140 feet feels like a long ways away from my driveway. I’m thinking somewhere in the 50′ to 60′ range as my “problem spot” is a downhill sloping away from where the fencing would be. Any observations you might have would be appreciated. The weight of the wood fencing would make it extremely difficult to install off the ground. I do remember my grandmother’s wooden snow fence becoming buried in some winters when we had deep snow. Elevating the fence allows it to accommodate a deeper snow load more effectively. We have wide open spaces with a big pasture just upwind of our driveway and strong winds, so placing the fence farther out seemed a better fit for us, but depending on your space, I’m sure the 60′ spacing would work fine. Thanks, Laurie. I have plenty of room so will plan to run out to the 140 feet. Living in a high end subdivision, wooden fencing will be what we install, and I’ll have to work with it to get it off the ground about 5 inches. My biggest challenge will be placement as I’m trying to prevent drifting in an area that slopes away from the fencing. I have a feeling we’ll do our best at positioning this year and then adjust as needed next year. Thanks for sharing your insights. I’ll be back to see further discussions with other readers. Getting the fence up off the ground makes the most difference when you have really deep snow, since it keep the fence from getting buried. Grandma always had her wooden snow fence right on the ground, and it still worked pretty well most years. After twenty years I have found that greater than 60′ is fine here in northern Michigan. Any closer and the post-fence drift eventually makes it to the drive. On bad years it still might make it. If you are planting spruces and such to take over the fence duties, plant them that far back too. I didn’t twenty years due to ignorance and now they’re too close, but still work OK. Where did you find the green snow fence? I’m sick of the ‘construction zone orange’. White would be even better. I found the green snow fence at Menards. You’re not the only one who’s tired of the orange. We had someone pull in when I was working outside last fall and ask where we got it from, too. This type of fencing can be enormously helpful in snowy places, but I wasn’t sure about how difficult it was to install. I have been looking into this for a while without finding much incentive to actually act on my desire to build one. However, your article was very informative and clearly instructive; I think I will finally do this! Thank you for all of your helpful tips and professional advice. My wife and I bought our first “out of town” house in April of 2014. Last winter not only killed our snowblower but almost both of our backs as well. This year I’m planning to put up a snow fence but had no idea how to even begin it properly. Thank you for the great info in your post, I feel much more comfortable tackling this now, I also know that I don’t want the fence right next to my drive (as a friend had suggested). Glad to be of help, Rob. I don’t know how much it will help, but it shouldn’t hurt anything. It sounds to me like you’re more worried about blocking wind, and it wouldn’t be a problem if some snow stacked against the house because it could provide insulation. If that’s the case, less than 60 feet shouldn’t be a problem. Yeah, went I went hunting, I noticed the information was pretty skimpy and not well organized, too. I’ve seen them around, but never given much thought to best placement and the science behind the air flow. I need to update the post with some photos from last winter. It wasn’t a heavy snow winter like the year before, but I could still tell that the snow stacked up downwind from the fence. I had a heck of a time getting a decent shot of the white on white. 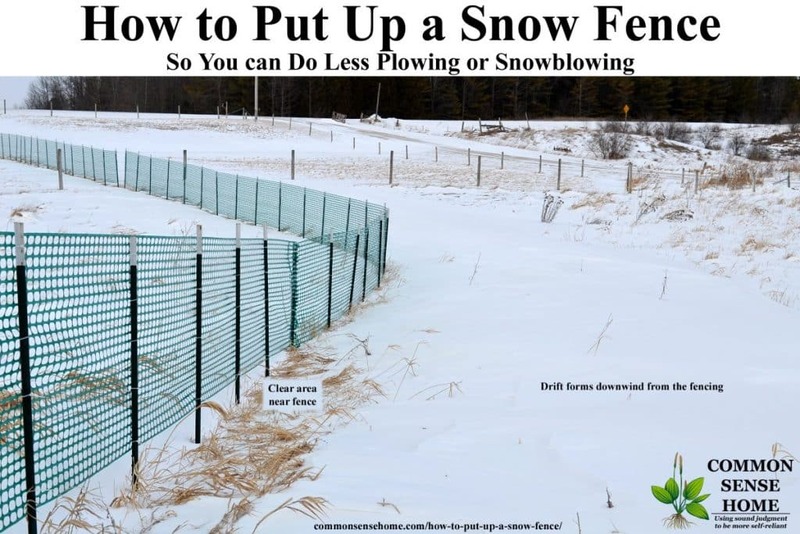 I have never thought about putting up a snow fence before, however, you suggest that this is a good option because it helps you redirect the snow piles and reduce the need for plowing. Thus, you can make the roadways around your home and community a lot more safe and potentially help reduce wrecks and injuries. Overall, it seems like this would be a smart option, so I will consider putting up around my home. Thank you for sharing! What are your suggestions for putting two fences parallel to each other in high drift areas? Worth the effort and how far should spacing be between them? I also have an area that creates a “triangle -like” tunnel between a house, shed, and garden shed. Sometimes the snow piles here 10′ tall or more. Any suggestions on placement for this situation? GREAT information! You’ll probably have to experiment with placement to see what works best with your layout. Maybe 30′ between, so you’re catching the first drift where it’s starting to taper? Thanks for the info. My T posts have multiple rounded metal studs protruding from the side facing the plastic fencing. How would one fasten the wood slats as they would fall to one side or the other unless notched? We have bumpy t-posts, too, which is another reason we opted to skip the slats. Husband suggests that if you wanted to use the slats, you could attach on the opposite side at an angle – ugly, but at least you could get contact along the entire edge. He and the boys also attached the zip ties at an angle across the thick part of the fence, thinking that it might take more to tear. I didn’t do that last year. We put up wooden slat snow fence for many years on the farm, and when we got bigger tractors and buckets we discontinued. Now we are retired and no longer have the big equipment and just today I put a short plastic one to prevent the snow from swirling around the house in front of the garage. I made a slat sandwich at each post. The slats are the width of the t-post, 4 ft long with a 1/4 in groove and the depth of the notches on the post. I did not use zip ties, but recycled plastic baling twine wrapped in barber pole fashion. A bit time consuming but so is putting up snow fence. Nothing wrong with working with what you have on hand. Thanks for sharing your experience. I was very happy to find your web site and really appreciated the pictures. All of this agreed with other data from fence/webbing manufacturers. My issue is more compressed. I don’t have 60′ to work with. I have a 1/2 acre lot with a south-end E-W-running drive and a 4’+ boulder retaining wall right on the south edge. In a blizzard, north winds prevail and I end up with 18-30″ drift/fill across the entire drive, effectively trapping the vehicles in the garage. When my blower is on the fritz (like this morning), my back suffers. I might have 20-25′ to work with, before my front lawn slopes downhill steeply to the north. I have read that lowering the fence height would draw the drift in. So if I use an 18″ fence the resulting drift might just reach the drive at that kind of spacing, yes? But at that low height, would enough really be collected to avoid snow still drifting in the drive? I could live with 6-8″ drifts. Am I basically out of luck with these compressed dimensions for applying some science to my problem? Either way, better blower maintenance is a must, apparently. As you can see from the photos, the biggest build up will be close to the fence, so even 20-25′ *should* help keep some of the snow off your driveway. Personally, I’d probably opt for the 4 foot fence – 18″ seems way too short to bother with – and keep it at ground level to start the drift right next to the fence. Thanks so much for this! I am too old to be doing all that shoveling. LAURIE, I AM TAKING CARE OF MOM’S INDIANA HOME AND THE N/S DRIVEWAY IS A PROBLEM FROM THE WEST WINDS AND DRIFTING SNOW. I AM PAYING $25.00 PER CLEANING. LAST YEAR WAS COSTLY. DRIVE WAY IS 3 CARS WIDE AND MAYBE 6 TO 7 CARS LONG. BUT I DON’T UNDERSTAND UPWIND AND DOWNWIND. I HAVE NO TROUBLE SHOVELING BUT ONCE THE DRIFTS START I HAVE TO CALL IN THE PLOW TRUCK. HELP. Look at the third photo in the post. See the arrows at the top right? The winds blow primarily from the west to the east, so the fence is placed west of the driveway so the winds will encounter the fence before they encounter the driveway. So – which direction do your driveway blocking winds come from? Put the fence that direction from your driveway to block them before they get to the driveway. I had the reddish wooden slat fence right next to my driveway and it CAUSED drifting. The Iowa DOT report says 35 times the height of the fence should be the distance away from the road/drive. That is what I am doing this year! The report also covers distances required when using multiple fence foes or if your wind direction is directly into your driveway (use an offset angle). Yes, right next to your driveway would be a bad thing. That’s why this post very clearly details how far the fence should be placed away from your driveway. I really appreciate all the advice given here, but have a question on technique for handling the wooden stake fencing. Do you have a method for joining two rolls of wooden snow fencing in a neat and tidy way? The wire is so stiff to work with. I actually live in on a “Snow Free” west coast island, but am creating an art installation with red wooden stake snow fencing. We’re not terribly focused on cosmetics here, given that the fence goes up and down every season. I’d probably overlap the end slats at the seam and wire or clamp them together. That is the plan…just thought there might be a ‘traditional’ tried and true way. What if you only have a couple feet to play with off the drive and not 35′ or so? Then unfortunately a snow fence is not likely to work very well, since it would slow and drop the snow in the area you want to keep clear – unless you could somehow make a deal with the neighbors for better placement. And we are alway cleaning up. How far away does the snow fence have to be to help us. Where does your wind come from? For a snow fence to work, it needs to be some distance from the area you are trying to protect. 60 feet is recommended, but after seeing how the drifts build up behind ours, I’d say 30 feet upwind would be a minimum distance. I found 30′ works fine and we have an open field and lots of wind in upstate NY. One section of our long driveway is angled 45 degrees with respect to the prevailing wind direction. Would you recommend several separate lengths of fence, each configured perpendicular to the wind? It would be easier just to keep going parallel with the driveway, but how much less effective would this be? Thanks for your advice. It’s pretty much impossible to say for sure how much of a difference it would make (no magic one fits all formula, unfortunately). I’d probably lean towards “easy” and see if if gets the results you want, and then if it doesn’t, modify next season and see if it works better. Since I wrote this post, we shifted our fence line closer to the road this year. The farther distance worked, but I think the distance on the snow fence packaging will also work, and may give a little more protection to our neighbor’s road to his hunting shack, which runs parallel to our driveway, downwind. Hi, I find your article and the question/answer section very informative. I have a question I am hoping you can answer. I am not trying to stop snowdrifts onto a driveway, but I am trying to stop snow blowing/drifting onto a covered patio that has trees/bushes about 5′ away on the wind side. I initially was going to purchase some sort of roll of black plastic or roll of privacy fencing (not slatted) and install right at the edge of the west side of the patio, maybe even taking it all the way around. The trees/bushes do not keep the snow from blowing onto the patio. I was on-line looking for what I should buy when I stumbled upon your article. Do you think my plan will help? It seems opposite from what everyone is suggesting for their driveways. Thank you. If I’m understanding correctly, you’re talking about putting up a solid fence in an attempt to keep the snow on the wind side of the fence. How effective this will be will depend on your winds and your snow. There will be a negative pressure area that wants to drop the snow downwind from the fence – whether the fence is solid or not completely solid. A lattice may be more effective, placed on the wind side of the shrubs out about 5 feet farther. We’ve been fighting with snow drifts the past few years and I decided to try out a fence this year. After asking at our local store, and browsing online, I found your site. Your article was by far the most informative and helpful. I’ve just come in from installing our snow fence, only 50′ due to space, and i’m hoping it works as well as your has so far. I’ll keep you updated. Thank you for all your help! Glad you appreciate the post. It would be great to hear how yours works out. As you said, much of the info out there simply isn’t very helpful. Laurie, can you recommend a company to order high quality snow fencing, online? We have several hundred feet of driveway as well. Fortunately, we also have plenty of room to install the fencing. Also, can you double the height? Will that be a benefit, or a hindrance? We purchased Quest brand snow fence through our local hardware store, but I can’t find that type on Amazon. 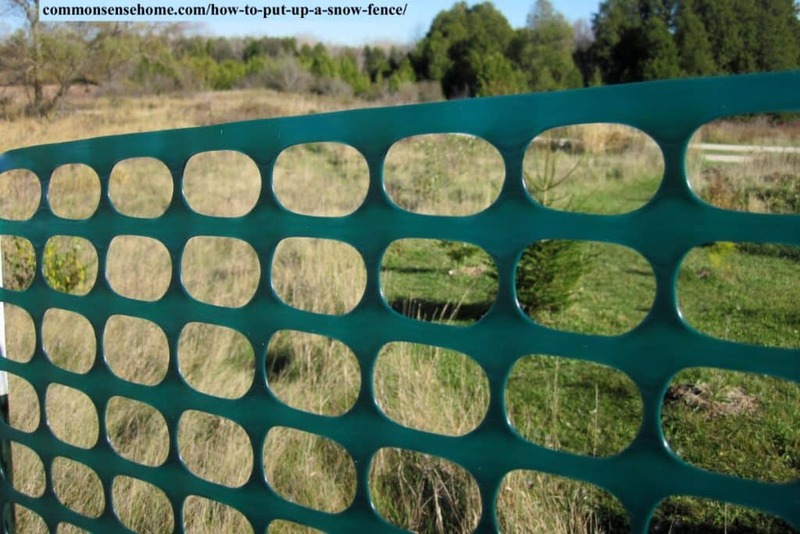 The Tenax Snow Guard Fence, Green, 4 by 50-Feet looks very similar and has good ratings. You can go with a 100 foot roll instead of the 50′, but the 50 footers are much easier to manage. 100 feet is very unwieldy. Unless you built a permanent structure, I think going higher would be difficult and unstable, with modest benefits, if any. Most of your drifting issues happen at ground level, and the default fence height is 4 feet tall. This is raised up off the ground, so you’re getting some wind blockage up to roughly 5 feet off the ground. We’re planting more trees and shrubs to take the place of a higher fence. In some areas of the plain states, they do put in taller permanent fences to protect roadways. I have an uphill driveway about halfway up the road takes a sweeping left turn and gets steeper, to the right the land rises in about 125’it rises about 30′ the wind comes from that direction. The snow drift is about 8’+ sloping to 3′ across the driveway. Would a snowfence help and where would it be located to most effective. Unfortunately, I can’t say for sure, because it’s hard for me to visualize your exact scenario. I think the odds are in your favor if you track where the drift is coming from and put a fence about 30 yards upwind of that spot in the driveway. Look at the way the snow blows around your hillside, and try to interrupt that flow before it stacks up on your driveway. What is the strategy for protecting a driveway which runs parallel to the wind direction? We have a 500+ drive which collects a fair amount of snow, some of it probably due to sloping terrain. I’ve heard of a herringbone pattern to the sides of a road but can’t find any information beyond that such as how close to the road it should start, at what angle away from the road it should be installed and how far apart they should be. Any thoughts about that? That’s a darn good question, George, and certainly not a typical snow fence use. I think a solution would have to be terrain specific. Check out where the snow is blowing in from, and why it stacks up where it stacks up, and work to change it to something more favorable. If there are curves or a slope, you’ll need to work with those. What’s upwind of your biggest snow drifts? Can you somehow stop or slow down the snow 30-50′ before it gets to the area you want to avoid? A herringbone might work, but if the wind is almost always coming straight down your driveway, I can’t see it being extremely effective. Whatever you try, make sure the fence isn’t within 30′ of the driveway if you can avoid it, as that’s likely to make the problem worse. Thanks for the great information. We just experienced our first winter in Colorado and we have the snow drift issue on our driveway. When the storms come through, the wind is blowing from the W/NW across the driveway which runs mostly North and South. To the West of the driveway, it’s pretty open other than some younger Aspen trees. The driveway is about 10 feet wide where the snow drifts. How far would a snow fence need to be placed to the West of the driveway to help cut down on the drifting? Thanks again! As mentioned in the article, we aim for at least 60 feet away from the driveway. Would the snow fence work with sand in the same way? Not exactly. Please keep in mind I am not a blowing sand expert, but given the differences in particle size and density, I think you’d see a reduction in drifting, but the drift conformation wouldn’t be quite the same. 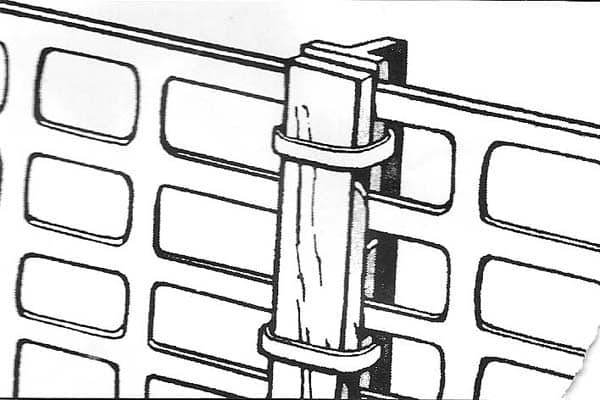 The sand fences I’ve seen have been wooden, and mounted at ground level – which means your drift starts at the fence. They also have to be even stronger than a snow fence, so I’d put my support posts closer together. Thanks for this post–it’s helpful and I have a follow up question. I am hoping to do a fence of trees and shrubs but don’t have the 130′ or even the 60′—maybe I have 40′. So I wondered if you have any idea if it works to “sock in” the area with lots of trees and shrubs to slow down the snow so much that you don’t get a drift? A friend thinks I’m better off to just let the wind blow through and take the snow with it. The problem with this idea is that I already know that there is one area on my drive that gets drifts so that is the area I was going to focus on. I’ve done a quick search but so far nothing has turned up that is useful. Unfortunately, with that small amount of distance to work in, you may indeed compound the problem with a snow fence, living or non-living. 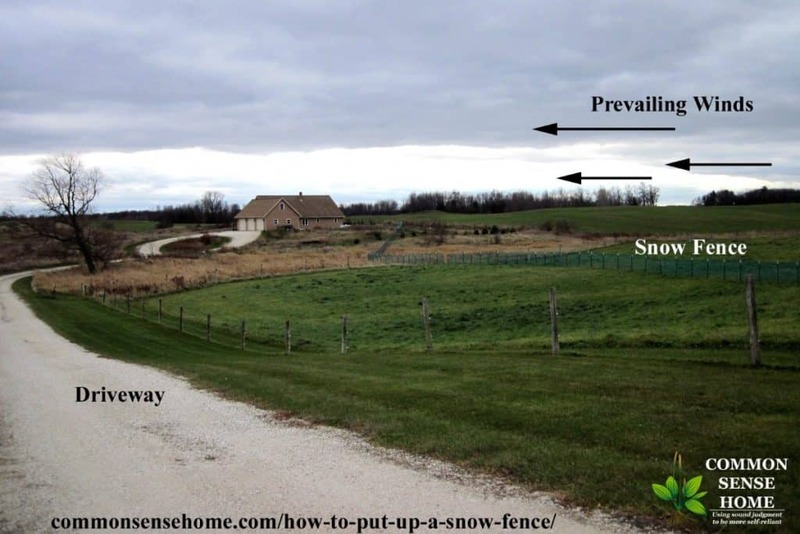 The only thing that I can think of trying to layer multiple fences by the problem area, so that each one will catch part of the snow to keep it off your driveway. Another use for snow fence in the winter is to use it to accumulate snow in a specific area. A few years ago I ran into a situation where my septic drain field froze (very, very bad). Since then I have used snow fence to control the drifting so it placed the maximum amount of snow right down the line of my drain field, thereby increasing the insulation value. As per the article “Wind-blown Snow as a Water Resource – Basics of Blizzards and Snowdrift Control” (http://www.wrds.uwyo.edu/wrds/rmfres/fendrift.html), the maximum drift depth develops near 6H (6 times the height of the fence) downwind and is about 1.2 times the fence height. So in my case, with a 4 foot fence plus 5 inch clearance on the bottom, the ideal placement of the fence was 27 feet from my drain field. I have been amazed at how well this works!! Good note. Thanks for sharing your experience, John. I got a lot out of your research on snow fences. I want to ask you if you think a fence would help me. I have tons of room to put a fence, BUT….my driveway has a gradual, vertical rise of a good 30-40 feet from the place where I would stake in the fence, 60 or so feet away. Think a fence would help me at all? If the wind is still moving along the ground, pushing drifting snow up that rise and onto your driveway, I would think that the fence would still slow down the flow. Laurie, thank you for your notes and responses to the above. I have a little different situation. My neighbors have a horse fence about 10′ from my driveway which is the cause of my large drifting right in the middle of my driveway. They are willing to let me put a snow fence inside their horse paddock. Considering the horse fence will remain, how far in should we put the snow fence? I’m guessing based on the other comments that 30′ inside the horse fence would seem reasonable. What are your thoughts? 30′ inside the horse fence should provide significant improvement.Since the fence is likely to be seasonal, you can watch your drift patterns the first year and adjust if needed. Hi Laurie, I also have a question about my snow buildup. I have a small farm in the middle of 300+ acres of rolling hills of alfalfa between Buffalo and Rochester, NY. My house is 50′ from a highway where there seem to be more accidents because of it. My horse barn is 36′ x 24′ and is parallel to the road which goes N-S. The front and back doors of the barn are N-S, and the driveway (which goes straight back to the barn) is perpendicular to the hwy. When I moved here I had a 3 story bank barn which was on its last legs. I moved in February and started building the small barn in August. I built the horse barn and 10 days after I had moved the horses from the bank barn, I was walking between the two with the wheelbarrow and heard a crack-I dropped the trolly and ran towards the new barn. The entire barn collapsed in a zig-zag-into the driveway. I have been trying to figure out how to keep the snow which is always horizontal, and high winds from collecting in front of the front doors of the new barn. I made a wind break out of a 6’x8′ barn door, and extended it out from the west back wall so that it created a corner. I thought it would work, but course, because it was like an extension of the back wall, the snow piled up in the corner. I finally then made the extension off the N-S corner so that it just extended the North side of the barn and the snow and wind would go beyond the front doors of the barn and accumulate towards the front of the property towards the road. It was fine until last night when it came down in the wind. Sorry this is so long- so now I’m going to build a permanent section between that corner and the paddock post behind the barn. My question-Should I start 1′ off the ground and then put the boards up with spaces in between them, or not. I’m using 1″ x 8″ oak boards from the old barn. I have a bit of protection from an Annex barn that is still standing where I store my wood, and the old barn that collapsed. I have photos but figured you didn’t accept them. Thank you for your patience. You can send photos to laurie at commonsenshome dot com, but I think I’m mostly following. In most cases, you want the fence to slow the snow down, not block it entirely. Locate fence where there is room downwind for the drift. The gap underneath influences where your drift will start forming. It sounds like you’re in big snow country, so I think a gap is a good idea. The same goes for the gaps between boards. You want to slow the snow down and create a drift, not try to keep all the snow stopped behind the fence. Small spaces between the boards will help with this. Thank you so much Laurie for wading through that tome. I will take some photos and send them when I get my barn work finished this morning. I have the boards all ready to install. Sounds good. I’m off to a slow start today. I think I may be fighting off some sort of bug. We have a driveway that runs north and south. The West side of the driveway has a 3 ft retaining wall. The east side has a 6ft retaining wall…the wind blows out of the West and northwest. The West side of the driveway fills full of snow. Anyway to prevent this? The lawn is level with the West retaining wall and open to a large field. If I understand correctly, your driveway is effectively a trough that is higher on the east side. That trough fills with snow. I don’t know that you could prevent it entirely given that it’s now a low spot for snow to collect, but you should be able to reduce the snow with a snow fence to the west. Great info, thanks! I definitely want to do a snow fence along our driveway for next season as we have a large open field to the windward side. So I understand that the fence causes a drift on the leeward side of the fence, which is the windward side of the driveway. I guess what I don’t understand is, as that drift builds up, why wouldn’t that snow continue to be blown onto the driveway. Also, won’t what is plowed to the windward side end up being blown back over the driveway, regardless of the fence? I’m just trying to determine how much a fence will help as I estimate it will cost about $500 to do. Thanks. The fence doesn’t keep all snow off your driveway. If that’s your expectation, it’s not going to happen. With an appropriately sized fence, it should continue to drop snow near the fence all winter. (Some melts down when it warms up outside. So far our drifts haven’t gotten more than a couple feet deep.) 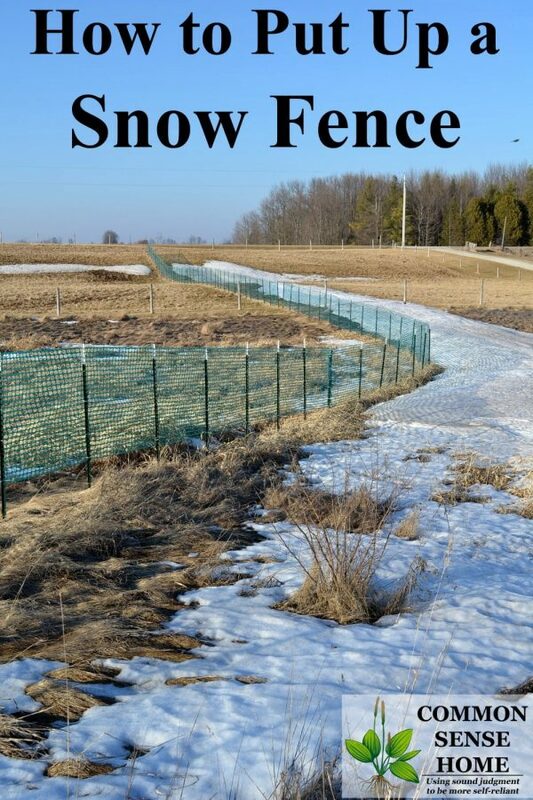 As long as fence is exposed above the snow, it should keep slowing down and catching the snow. That’s why they install big, honking snow fences in deep snow territory. So far our four footer has been more than up to the job here in northeast Wisconsin. I hope this clears up what the fence can and cannot do. Thanks. No, I don’t expect a snow fence to keep ALL snow off the driveway (especially dry snow that will continue to blow), but keeping the big drifting off would be a big help. Just one point of clarification- you say, “I don’t recommended stacking your snow on the windward side of your driveway.” You must be referring to plowing, right? Because the idea of the snow fence is to stack snow on the windward side of the driveway, right? Yes, I’m referring to snow plowing, since as I understood it, you mentioned plowed piles on the windward side blowing back into the driveway. The snow stacked by the fence should, for the most part, be well away from your driveway, mostly stacked up right near the fence. I’m so glad to see you are still answering questions here. I am having trouble figuring out where I should put my snow fence to protect an 80′ round pen from drifting. This winter a windslab drift collected over the top of the round pen’s 6′ high post and rail fence and broke the top rail! I dont think it will melt out before July and I need to use my round pen all winter. The round pen is at the top of a hill that steeply drops away to the north. A western parallel post and pole fence line with a row of shrubs on its south face runs due west from where it meets the round pen. The monster drift begins just south of this fenceline, in our level front yard. The prevailing wind direction is northwest, west, and southwest, depending on the storm. The drift accumulated over the round pen fence on its western side, south of the hedrow and line fence. If I simple board up this side of the round pen and leave no gaps, will it prevent the monster drift Inside the pen? A drift fence erected as you advise would land smack in the middle of our front yard and I fear would cause drifts to build up against our house, further to the west. As an alternative, would putting a drift fence north of the line of shrubs, running east-west, and set back about 15 feet or so from the shrubs help at all? I can’t set it back any further than that because it would then interfere with the barn and paddocks. I’m doing my best to picture what you’ve described, but there are missing pieces and it’s a complicated situation. If the drift accumulated from the western side, and you want to avoid drifting from that side, you’ll need to block the wind from the west. I don’t think a fence that runs east to west would have the desired affect, unless I’m missing something in your description. If I understand correctly, the drift piled up south of the existing fence and shrubs, but built from east to west. If this is correct, then as I said above, you need to block from the west. If the drift built from north to south (piling up to the south of the fence and shrubs), then a fence north of the shrubs would probably help. Look which direction the drift is building from, aim to put your snow fence or fences to block that direction. That’s all you can do. Boarding up the fence will force more snow to stay on the outside of the fence, but it sounds like you get enough snow that eventually the drift would still force its way over the top of the fence. You may need to experiment with different fence configurations and see if one helps more than another. It’s tough working around existing buildings and keeping right of ways open for access, but think about natural extensions of wind blocks that make sense. Even if you have to put up a fence or plant trees farther out, they can still be used to slow down the wind before it gets into the yard and causes trouble. I am realizing I don’t know if the drift started inside the pen and spilled out into the yard, or started in the yard and spilled over into the pen. It could have been either. I think the real solution might be moving to a warmer climate. We had record breaking snow this winter. It’s been just awful. You could email the picture, but I think my recommendations would be similar – figure out where the snow is coming from and block it. And yes, moving to a warmer climate may be the only real solution. I live in a mobile home park. I have a 45′ x 10′ patio deck that runs east/west. The neighbor’s trailer and mine, are about 10 feet between us, with him being to the south of me. My deck sides (east/west), as well as north/south ( where the steps go down), are the normal white metal patio sides, which are about 3′ high, with a gap under. I am not worried about the north side, as there is a high fence. My deck gets ALOT of snow, and sometimes it actually blocks my door. My driveway is on the east side, just in front of the front stairs. I was thinking, what if I was to interweave the fencing through the bars on the deck. down the 45′ long side, and also closing in the back side (where the steps at the back are (west), and partially through the east side, as well as the landing on the east side (2 sets of steps), just in front of where I park my car. Do you think that would work some, or could you suggest something different that might? Any advice would be greatly appreciated. Thank you. Which direction do your prevailing winds come from? You don’t mention the wind direction or location of your mobile home. Snow fences aren’t designed to stop all snow from getting past them, they’re designed to drop snow closer to the fence and away from a driveway or other area you want to protect. If you fence the sides of the deck, it’s possible that the snow fence may cause more snow to stack up, if you use it like a normal snow fence with the gap underneath. I don’t know if you’ll be able to block the all the snow if you attempt to make a solid wall out of your “normal white metal patio sides”, because I don’t know what “normal white metal patio sides” are. Most mobile homes around here have wooden decks and railings. It sounds like you may already have a three foot high solid fence with a gap? I can’t tell from the description, but if that’s the case, then your sides are probably giving all the protection they can. Closing off the west stair may help, but it’s not a guarantee. Are the winds out of the west? If so, then putting a fence to the west of the deck is the direction you would want to go, if there’s room. I just purchased a house situated in a large open field on the Western side of a high hill overlooking a wide and windy lake valley in Vermont. My driveway runs North and South along the hillside and I’m told that one particular section is known for catching 7 foot snow drifts. Because of the sloop of the hill up to the driveway and then beyond, I’m wondering how much the sloop will be a factor in determining the distance downhill away from my driveway I should place a snow fence? Any advice will be greatly appreciated! I don’t have any direct experience with slopes, and every situation is a little different because every driveway and wind pattern is a little different. I’d opt for the default distance to start, and adjust the next winter based on how it works the first season. I just purchased a house situated in a large open field on the Western side of a high hill overlooking a wide and windy lake valley in Vermont. My driveway runs North and South along the hillside and I’m told that one particular section is known for catching 7 foot snow drifts. Because of the slope of the hill up to the driveway and then beyond, I’m wondering how much the slope will be a factor in determining the distance downhill away from my driveway I should place a snow fence? Any advice will be greatly appreciated! I still don’t have any new experience dealing with slopes since the last time you commented, Dan. Put a fence up, see where the snow stacks, adjust accordingly the following year, and make sure you have some way to plow heavy drifts this year in case you don’t get the fence placement right. Can you attach a snow fence to an existing fence? Say a five strand wire fence. Possibly. You’d need supports at least every 8 feet, and a way to attach to your fence posts. If you’re already using t-posts an the fence is not electrified, it should be fairly straightforward to add on a snow fence seasonally. The location for one fence might not be the optimal location for the other, but if you have a situation where it is, so much the better. What a great article and follow up comments. I am considering this solution to prevent snow drifts from blocking off heater and hot water ventilation pipes, which then shut down my systems. The only thing is the drifts occur between my neighbor and my house where We only have roughly a 30 foot corridor. The wind is coming from east and I was thinking of placing fence angled past the back of my house running it north/south, or would it be better closer to these ventilation pipes. The drifts get so bad that I have to go out in the middle of the night during a storm to clear out the area. I am 70 years old now and cannot see myself doing that much longer. Is there a particular mesh design that is better than others? Thank you for your insight. Without a site diagram it’s a little tough to tell exactly what’s going on, but with the tight conditions, you might want to try putting the fence directly on the ground so that the snow starts to pile up as close to the fence as possible – not near your vent pipes. Remember, the goal of the fence is to slow down the wind and drop the snow near the fence instead of in the area you’re trying to keep clear. So – east wind + north south fence = makes sense. Farther away from pipes – check. If snow gets so deep it is likely to bury fence on ground, mount fence with gap underneath. If snow gets less deep, ground mount will probably get the job done, and be a little easier to get done. From what I’ve seen, snow fence comes in standard mesh size, just a couple different colors. There’s also the wooden fence, but that’s a little heavier and bulkier. If you can draft some young muscle into helping put up the fence, so much the better. The shorter rolls are lighter, of course, so get only as much as you need. You can usually find it in 25′, 50′ and 100′ lengths. My husband and I are spending our first winter in our new house, and have already come across the problem of our driveway drifting shut. We got a snow blower, which made a vast improvement, but the wind drifted it all back over again during the night. At this point, is it too late to put up fencing for this season? I was hoping we wouldn’t have too many problems, because the high-wind side is already supported by a property-line fence. Unfortunately, the wind whips around it instead, since that isn’t the purpose of the fence. I could probably figure out the best placements for the fencing using this page as a guideline (as well as some trial and error), but not sure if I’m getting it too late for this year. We’ve spent most of the weekend under blizzard-like conditions (and it’s Monday now, with a blizzard warning in effect until Tuesday at noon), so definitely could use a snow fence. Can you physically put the fence up? Around here, our ground is frozen, so it would be extremely tough to put a fence up at this time of year. If you can put the fence up, it’s not too late. Plenty of winter left. We have some pretty tall drifting, and our ground is likely frozen. We’re in southeastern Notth Dakota, so it may be too late for this year to get anything up at this point. Yeah, if you’re in North Dakota, odds are your ground is frozen by this point. So far your article has been the clearest addressing the problem of drifting snow but I still can’t figure out how to address my situation. I live in central Minnesota in the middle of farm country. My house sits on just over an acre on a corner. My house and driveway face west. My driveway is about 60 (?) feet long with a slight incline. There are fields all around me. The snow drifts terribly on the apron in front of the garage. Wind direction is from the west/north in the winter. There are small trees and bushes on the northwest corner of the property. Where should I put a snow fence? Unfortunately, if I’m understanding your layout correctly, your driveway and home are not well positioned to be helped by a snowfence. If the slope is towards the house, and that garage door faces west – where much of the wind comes from – the snow is naturally going to be driven right down the driveway to pile up in front of the garage. You may see some improvement by putting a fence (or more plantings) to the north of the driveway, but if the wind comes from the west and the driveway comes from the west, you can’t block one without blocking the other.